And the weirdnesses keep coming, Bill! Hi Victoria, that episode came from my investigation that’s written up in my book, Real Wolfmen. I put the producers in touch with that family, by their permission. The show does exaggerate some things such as the perfect footprints, family going to bed with an ax, the extent of those lights in the trees, etc. I do believe the eyewitnesses and still talk with them. I posted a story on this site years ago called, I think, BARBARA SAW MOTHMAN. It was in the ’60s in West Virginia, USA while visiting relatives, and she found it terrifying. Red glowing eyes and all. There was evidence the next morning in the snow. She screamed bloody murder and no way could any beast nor prankster get up to that window in a split-level house. She had not heard any stories prior to this incident. The family was accustomed to hunting and knew how to look at tracks. In this case, they, the tracks inspected next morning in new snow, came out of the woods and there was no retreat pattern. It scared the bejeezus outta her. I knew her to be quite an honest person and she had no gain from telling me this story. She’d gotten up to go use the toilet in a relatives’ house late at night. If anyone faked this, it was a cruel and very sophisticated thing to do to a little girl. Barb was not prone to sleepwalking — we were roomies for two years in Ohio. Was she of sound mind and body? I cannot say. She does have mild epilepsy and is Native American, so go figure. But those tracks? Were here whole family lying? I don’t see a motive. I knew her to be a very responsible person. Go figure. I also met some of her relatives and I guess you could call them the salt of the Earth but these were not wild and crazy people. Quite a story and I must say, I always believed her. Thank you for this interesting point of the ufo’s and the upright canines creatures. I also thought that to b a coincidence or that they actually could b multidimensional just because they tend to disappear in thin air in an instant after being spotted by a human. I truly believe these things are real and intelligent. I myself had lost 6 hours time i can’t account for and only remember the very last thing i could. I was smoking ny cigarette as usual @ 2:30 pm, before going in the subway, but like in a blink of an eye found myself in another place 6 hours later in a crowded fas food joint startled and confused not remembering a thing. 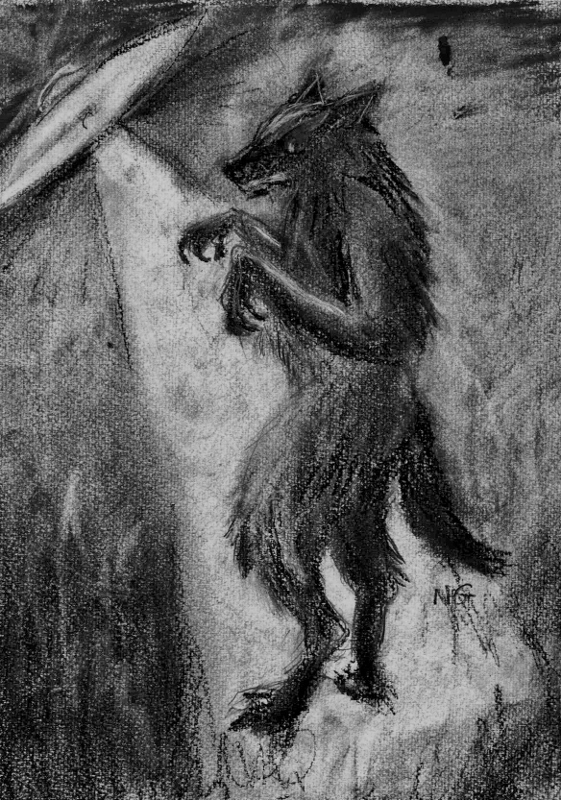 All my life ive been drawn to wolves and the night mysteries. Thanks again Linda for this intetesting research!!! Hi Linda I am a huge fan of your books and unexplained “manwolf” creatures. I was wondering if you had heard of a family who appeared on the show Paranormal Witness who were stalked and effectively confined to their home by a pack of unexplained creatures. What is interesting about the story is the fact the husband and wife saw flashing lights in the marsh before the activity began. I suppose my question is in your opinion could this suggest other worldly phenomenon? Or could it be a mere coincidence coinciding with the sighting? Also if you’ve perhaps already seen the episode and/or have spoken with the family what are your thoughts on the occurrence? Excellent write-up Adnil. Interesting situations here. Like Keel, I keep seeing way too many overlapping weirdnesses in far too many areas to hold on to “rational” views about “adaptive or mutated” lupines. Thanks Ellen, I’m a big fan of trail cams, whether you catch anomalous things or not. The normal wildlife is always interesting, too! Would love to see anything really weird! Interesting post as always, Linda. My friend live adjacent to the Forest Preserve along the Des Plaines river. His son gave him an infra-red camera and he captures some really weird things on it. Doesn’t run the camera in the winter, but soon he’ll start checking it again.